Cornerstone laid on a massive project to construct a new financial district in Jerusalem as UNESCO votes to deny Jewish connection to city. 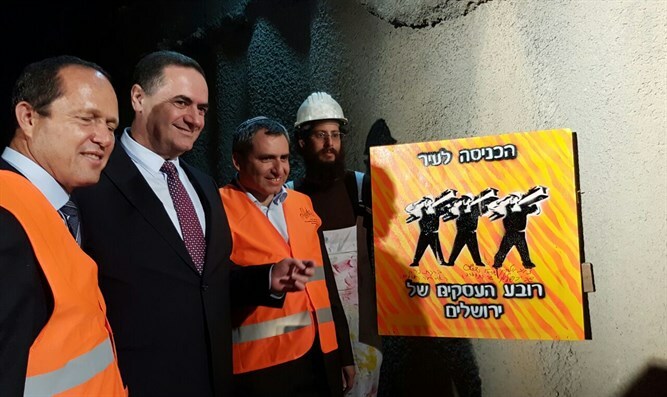 The cornerstone laying was held Wednesday night for a new business district at the entrance to Jerusalem in a festive ceremony. Attending the ceremony were Jerusalem Mayor Nir Barkat and Ministers Ze'ev Elkin and Yaakov Katz. Speaking at the ceremony, Elkin related the construction project to the vote by UNESCO earlier in the day to deny the connection between the Jewish people and their holy sites in Jerusalem. "On this day in which UNESCO denies our connection to Jerusalem-there is no better time to speak about the future of Jerusalem." The project, called "The Entrance to Jerusalem,' is expected to become one of the most prominent business districts in the country in the coming years. It will be built with an investment of 1.4 billion shekels ($364 million) and cover an area of about 211 hectares (521 acres). It is also expected to bring 40,000 new jobs to Israel's capital. The project is also expected to become a major transportation hub, with a high speed railway, two light rails, and public transit routes. Jerusalem Mayor Nir Barkat said "This is the largest and most significant project for the future of Jerusalem. Tens of thousands of new jobs in an area five times larger than the Azrieli Towers (in Te Aviv), a significant supply of labor to boost the economy of Jerusalem, the most advanced transportation center in Israel, the largest convention center in the country, tunnels, roads, and the most modern accommodations will link together into one bustling, vibrant area." "The new entrance to Jerusalem will open new opportunities and endless possibilities," Barkat went on. "After the building of the new business district Jerusalem will be different from what it was before - a city with its glorious history sitting next to its radical changes from decay to growth, from net migration to becoming an attractive city for young people, and from dwindling city resources to a leader in economic growth that stands on its own two feet - for future generations." The new district will include business centers, hotels, and leisure and culture activities with a total investment of about 10 billion shekels ($2.6 billion). According to estimates, about 65,000 people will move through the new business district every day. The new district area will include 24 buildings, 14 of which will be high-rise buildings over 24 stories tall. Another 9 buildings will be skyscrapers 36 stories tall. Work began on the project last year without any disturbance to the public.